Pleitegeigers Weblog » Thursday the 12th is evil! - Glaube. Liebe. Hoffnung. NUR DER HSV! Thursday the 12th is evil! Tomorrow’s Friday the 13th. But, to be honest, after all that I’ve gone through today, on an ordinary Thursday the 12th, I can face that day with a grin. It can hardly get worse. It started in the morning, when I stood at the bus stop waiting for the bus to take me to work for about 25 minutes. Normally a bus shows up every 5 minutes. I should have taken that as a sign, bought myself a bottle of vodka and crawled into bed. Next was the ticket desaster. I still have no ticket, but people around me either have tickets or say things like “I’m so glad I don’t have tickets, it saves me a lot of money.” after having planned to fly with me to London for weeks. Anyway. Next was some weird things going on at work, I don’t wanna talk about. I decided to spend the rest of the evening sitting here without trying to cook something eatable (Otherwise I might burn the house down). I’ll just do a bit of writing and hope my notebook will still be alive tomorrow. 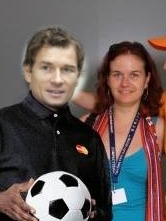 Steve made found this picture of me and Jens Lehmann which definitely proofs I’m a WAG (Wives and girlfriends, for those amongst us not knowing this abbreviation) and need to attend the match Arsenal vs. Hamburg. Look at the nice black gloves Jens is wearing…! I didn’t even know there was a 200 Euro note!! How does it look like? Black gloves? Where the hell…? Or is this a joke I missed? Würde ich keine Blogs lesen, wäre mir wahrscheinlich gar nicht aufgefallen, dass heute Freitag der 13. ist. Schuld ist – natürlich – eine Frau. Also – daran, dass es mir aufgefallen ist. Nicht am 13. an sich, dass wäre doch ein wenig hart…. Übrigens soll der heutige Freitag der doppelt böse sein, weil die Quersumme aus 13.10.2006 wieder 13 gibt. Hm. Ich dachte immer, Quersummen seien einstellig?